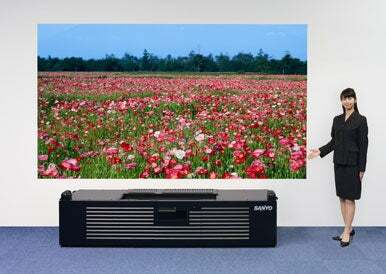 Sanyo Electric has unveiled a short-throw laser projector that can display a 100-inch high-definition image that's brighter and has more vivid colors than anything else on the market, it said this week. The prototype projector builds on Sanyo’s ultra-short focus technology that makes use of a large diameter aspheric lens and high-precision aspheric mirror to project a large image from a short distance. The company already has a short-throw projector on the market, the LP-XL51, but that uses a conventional lamp as its light source and manages an 80-inch image over just 8 centimeters with a brightness of 2,700 lumens. Compared to these specifications, the prototype is in an altogether different class. Sanyo has switched from a bulb to a laser light source resulting in a much brighter and richer picture. Efficiencies in light usage result in a projected image with brightness of 7,000 lumens, which is a record for laser projectors, said Reina Mito, a Sanyo spokeswoman. The use of a laser and an improved image processing engine also means the projected image has a color range of about 170 percent that of a standard NTSC image. That means colors are about twice as rich as could be expected from an LCD television, Sanyo said. It can also project bigger images managing a full high-def 100-inch image over 63 centimeters or a 150-inch image over 94 centimeters. These combine to give the projector the shortest throw ratio yet accomplished with such a projector, said Mito. 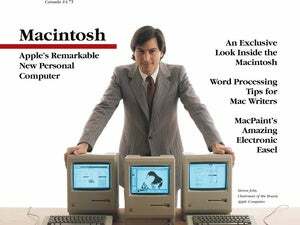 Compared to the commercial model its also bigger—much bigger. The prototype is an impressive 2.4 meters long by 51 centimeters by 63 centimeters, which puts it into the same league as a large piece of furniture. Part of the size is due to its nature, prototypes are rarely small and compact, and partly from the use of a laser light source and the new image processing that has gone inside. The size will be reduced as Sanyo takes the technology closer to commercial production. Development continues and while there are plans to commercialize the technology, there's no set timeframe for doing so at present. Sanyo is initially aiming the technology at use in places like conference rooms and halls and for digital cinema or digital signage applications.